RUDN chemists developed a catalyst to oxidize alkanes without additional heating and under regular pressure. This will simplify the process of obtaining alcohols, acids, and other substances used to manufacture organic products. The article was published in Inorganic Chemistry. Alkanes are saturated hydrocarbons, the main components of oil and natural gas. They are used as fuel and a source material for organic products—alcohols, aldehydes, acids and ketones. The internal bonds in alkanes are so strong that they are difficult to break even with such aggressive substances as concentrated sulphuric acid or potassium permanganate. Therefore, chemical reactions with alkanes require temperatures at 200–300 degrees C and high pressure, as well as efficient catalysts. 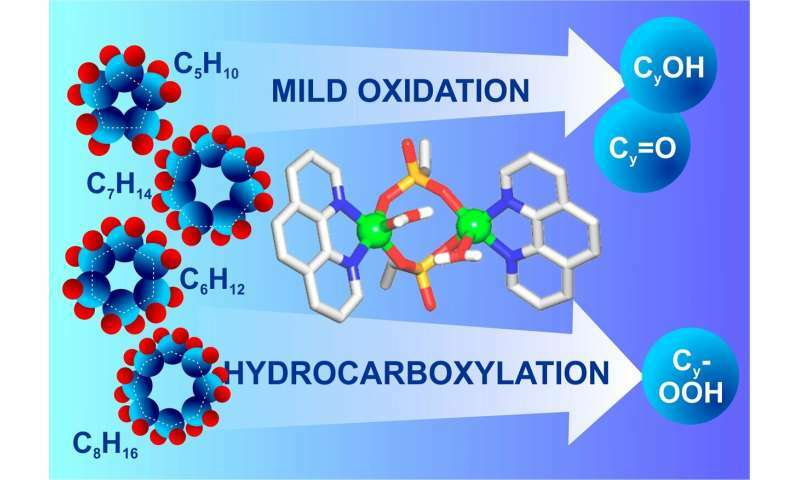 RUDN chemists suggested a new copper-based catalyst that simplifies the oxidation of alkanes. With it, reactions can take place at 50–60 degrees C and under atmospheric pressure. The new catalyst is a dimeric copper complex in which two copper ions are connected with bridge phosphate ligands and additionally stabilized with 1,10-phenanthroline. The catalyst was obtained from a water solution using a simple method of self-assembly and in presence of inexpensive reaction agents. In the course of the process copper sulphate was mixed with phosphonic acid and 1,10-phenanthroline with defined pH and further crystallization. According to RUDN chemists, the catalyst shows oxidising activity in reactions with cycloalkanes—alkanes that look like a closed circuit. To observe the reaction, hydrocarbons and hydrogen peroxide were added to the solution into which the catalyst was placed. The chemists managed to obtain two groups of organic compounds: alcohols and ketones. They are used as solvents (e.g. acetone) and to synthesize pharmaceutical drugs. Currently, the catalyst is destroyed after the first use and cannot be restored. But the scientists know that catalysts like this may be regenerated and reused. The authors of the work want to create a multiple-use catalyst for chemical reactions with alkanes. "The restoration of the catalyst remains a complex task. In our future studies we may focus on the manufacture of the so-called restorable heterogeneous catalytic systems including copper compounds. Moreover, we will continue the studies to broaden the range of cognate copper catalysts and types of substrates," said Alexander Kirillov, a co-author of the work, Ph.D. in chemistry, and an associate of the Joint Institute for Chemical Studies at RUDN.